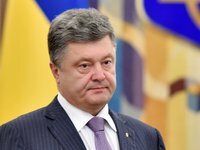 Ukrainian President Petro Poroshenko has said he hopes that Russia will set free the Ukrainian sailors, who are detained as a result of the Kerch incident, after the Ukrainian presidential election. "Unfortunately, I am not expecting positive news before the presidential election. Putin has made it clear that he will not take a single step. But [...] we are expecting you to return home as soon as the victory is won," Poroshenko told the television channel ICTV in an interview aired on Sunday. The Ukrainian presidential election will take place on March 31. Russian border guards opened fire on November 25, 2018, to detain Ukraine's Yany Kapu tugboat and Berdiansk and Nikopol artillery ships en route from Odesa to Mariupol through the Kerch Strait. The ships were escorted to Kerch. Kyiv called the conduct of Russian border guards unlawful. In its opinion, Russia breached the United Nations Convention on the Law of the Sea and the Russian-Ukrainian Agreement on Cooperation in the Sea of Azov and the Kerch Strait. Twenty-four crewmembers, including two officers of the Ukrainian Security Service, were indicted on counts of "illegal crossing of the border by a group of conspiring persons or an organized group, with the use of violence or with a threat to use violence." The offense is punishable with up to six years in jail. The Ukrainian sailors were transferred to Moscow in late November. The court put them under arrest until April 24. Kyiv defined the sailors as prisoners of war.